by Marie Sharpe Ham, Debra A. Blake, and C. Edward Morris. Excerpted from North Carolina's First Ladies, 1891-2001, copyright 2001. Reprinted with permission from North Carolina Historical Publications, North Carolina Department of Natural and Cultural Resources. See Also: Cameron Morrison - Dictionary of North Carolina Biography; Governor Cameron Morrison - Research Branch, NC Office of Archives and History; First Ladies and Gentlemen of North Carolina NCpedia collection. Governor Cameron Morrison surprised most people when he married Sara Virginia Ecker Watts on April 2, 1924, at Harwood Hall in Durham. The governor had been a widower since 1919, the year his first wife, Lottie May Tomlinson Morrison, died. Following the newly married couple's honeymoon in New York, they returned to the Executive Mansion. Sara Morrison was born March 14, 1868, in Belle Isle, New York, to Isaac Scott and Mary Scott Ecker. She had at least two sisters and a brother. While growing up, she developed a deep awareness of the individual's role in a "Divine Plan," which gave her a feeling of responsibility for others. Her chosen education and profession were directly tied to her beliefs. She received a nursing degree from Johns Hopkins University and was employed there. While at Johns Hopkins Hospital she met her first husband, George Washington Watts, who was attending to his wife, who was ill. Sara Ecker served as a private-duty nurse in Durham until Mrs. Watts's death in 1916. George W. Watts and Sara Ecker were married in 1917 and lived at Harwood Hall, their residence in Durham, until his death in 1921. Sara Watts inherited considerable wealth from her husband and continued the philanthropy he had practiced. Sara Morrison's personality served her well during her short tenure as first lady. She was friendly and warm and made visitors feel at home and comfortable. Not having grown up with elaborate entertaining, she became accustomed to that life-style while married to her first hus­band. Having been a professional woman and single for much of her adult life, she developed level-headedness and a sense of what she wanted. She employed her management skills and sense of caring to her new vocation as first lady. Upon leaving the Executive Mansion, Governor and Sara Morrison remained for a time at Harwood Hall in Durham before continuing to the gover­nor's own home in Charlotte. His daughter Angelia and sister Ida Morrison went immediately to Charlotte. Soon afterward the couple built a new home and farm known as Morrocroft. When Governor O. Max Gardner appointed Cameron Morrison to a vacant seat in the United States Senate, the couple moved to Washington, D.C. After Morrison lost a bid for election to a full term in the Senate, he and his wife moved back to their beloved home and farm in Charlotte. Sara Morrison enjoyed needlework; gardening and reading were likewise hobbies. She helped operate the Welcome Wagon service in Charlotte. She and her husband assisted hun­dreds of young men and women in their quest to receive a higher education. They were con­cerned for the well-being and comfort of the tenants on their farm and home, as well as the education of the tenants' children. Of great importance to Sara Morrison were the Presbyterian Church, local and worldwide mission work, and educational endeavors. She always shied away from publicity and often did her kind deeds anonymously. The chapel at Convenant Presbyterian Church is named for her, as is a building at Queens College. In 1930 Davidson College presented her with the Algernon Sydney Sullivan Award for service to humanity. She endowed the Assembly Training School and the Union Theological Seminary in Richmond, as well as the Stuart Robinson School in Blackey, Kentucky. She was a member of the board of trustees for Stonewall Jackson Training School in Concord, the YWCA in Durham and Charlotte, Queens College in Charlotte, and Watts Hospital in Durham. Preceding her husband in death, Sara Morrison passed away on May 26, 1950, from cancer and was buried at Charlotte's Elmwood Cemetery. At the time of her death, an editorial in the Charlotte News (May 27, 1950) pointed out that "Wealthy people differ in their attitudes towards their possessions. Mrs. Cameron Morrison belonged to the group of wealthy individ­uals who feel that their good fortune gives them an opportunity to put some of their wealth to use for the benefit of the community and society in general. Quietly, unostentatiously she managed to strike a nice balance in her dual role as wife of an important public servant and benefactress of many worthy institutions and undertakings. . . . [H]er influence went far beyond the circle of her personal friends and acquaintances and will last for a long time." Ham, Marie Sharpe, Debra A. Blake, and C. Edward Morris. 2001. North Carolina's First Ladies, 1891-2001. Raleigh, N.C.: Executive Mansion Fine Arts Committee and Executive Mansion Fund. 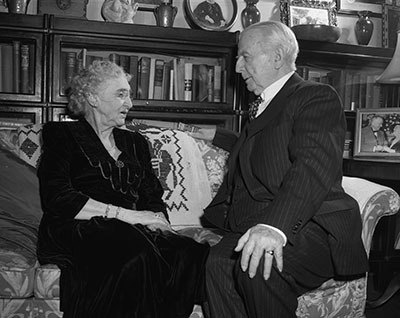 Former Governor and Mrs. Cameron Morrison visit Raleigh, 9 February 1947. (Photo copyright N&O). NO_47_2_3. Photograph. State Archives of North Carolina.